Our trained service technicians are fully equipped with everything needed to do on and off site repairs. The technicians are capable of working on all makes and models of forklifts and material handling equipment. They have quick turn around times to save the customer valuable time and money. 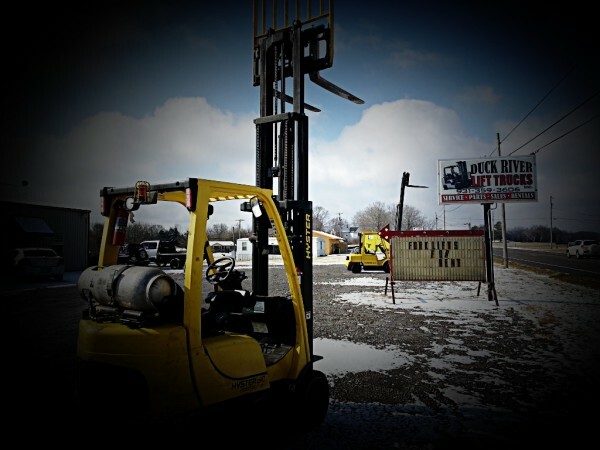 Duck River Lift Trucks also offers a regular maintenance schedule to keep your forklifts in tip top shape so down time is minimal. We also pride ourselves in our competitive rates and are sure to save your company down time and money! If your looking to get a forklift or other equipment at a competitive price, we can make that happen! We can get new and used material handling equipment to fit your application. To get purchase details or if you have any questions about what type of equipment is best for your application, just give us a call or send us a message from our contact page message board. If you are in need of any material handling equipment, just give us a call and our rental department can make sure you get the right equipment to get the job done! We have many different types of equipment to fit your application, and quick delviery times. We are a dealer for the worlds largest forklift aftermarket parts distributors. Whether your equipment is new or used, we have you covered.